MEDITECH’s Oncology solution integrates efficient, specialty-driven workflows into the EHR, enabling oncologists to coordinate patient care across all care delivery settings while also bridging gaps in care. Learn how improved efficiency, care coordination, patient safety, and revenue realization all play important roles in MEDITECH’s Oncology solution managing complex cancer care. Dynamic and flexible data summaries that consolidate key patient data from across your health system. Enhanced consumer experience and engagement to support both patients and their families. Robust clinical decision support and closed-loop chemotherapeutic medication management to prevent errors. In the United States alone, cancer-related costs may reach as high as $173 billion by 2020 if current growth rates continue. MEDITECH’s integrated Revenue Cycle solution helps maximize reimbursement by gathering the right patient information upon initial contact through to final billing. Organizations can charge immediately after care is delivered, shortening the payment cycle and improving financial sustainability. 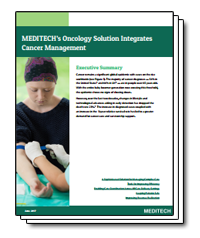 Download this White Paper to learn more about how MEDITECH’s Oncology solution enables oncology staff to meet these challenges while also incorporating efficient, specialty-driven workflows into the EHR.